Never wishing to feel like I'm missing out, I have to admit to being a little miffed if Christmas Day comes around and I find that I have to forgo all of the trimmings. But stuffing is so versatile. It can easily be adapted to suit everyone. 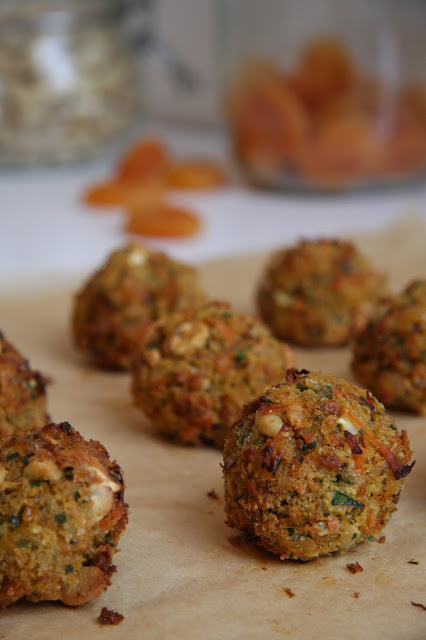 These Carrot, Cashew & Apricot Stuffing Balls are crispy on the outside and soft in the middle. Lightly spiced, with little nuggets of sweetness from the dried apricots, they work as well with turkey or goose as they do with a vegetarian main course. In fact, I'd quite happily forgo the main event for a pile of these little morsels, roasties, buttered kale, honey and lime roasted parsnips and a huge jug of vegetarian gravy. They taste just as good cold the day after, so make sure there are plenty to snack on when Boxing Day comes around. And if you do have happen to have some leftover (or if you make a double batch) they make great snacks for children (and adults). To make this recipe vegan, replace the butter with olive oil and use your usual egg replacer instead of the eggs. Put the cashew nuts on a small baking tray and roast in the oven for 8-9 minutes, until they are a light golden colour. This really enhances their flavour, so well worth doing. Remove from the oven, leave to cool and then roughly chop. If you are feeding babies or very young children, you can pulse the cashew nuts in a food processor until they resemble breadcrumbs instead of chopping them so there's no risk of choking. Whilst the cashew nuts are in the oven, put a small frying pan over a medium heat. Add the butter. Once the butter has melted add the onion and turn the heat down a little. Cook for 7-8 minutes, stirring often, until the onion has softened and is beginning to turn golden at the edges. Add the grated carrot and continue to cook, stirring often, for a further 5 minutes, until the carrot has softened. Add the ground cumin and cook for a minute or two. Transfer the onion and carrot mixture to a large mixing bowl and leave to cool. Once cool, add the orange zest, breadcrumbs, chopped dried apricots, chopped flat leaf parsley, roasted cashew nuts and season (I don't add salt as I cook for young children and there is already salt in the breadcrumbs, but if you are cooking for adults you will probably want to add salt and pepper to suit your tastes). Stir well to combine. Add the beaten egg to the mixing bowl, a little at a time, and mix well (I use sourdough breadcrumbs which seem to need a little more egg to combine, but you may not need the full amount, so add gradually). Form the mixture into 9 balls, each about the size of a golf ball, and place them on the lined baking tray. Put the baking tray in the oven and bake for 20 minutes, until the stuffing balls are golden and a little crispy at the edges. Serve hot or cold. The stuffing balls can be made ahead, cooled and frozen. Defrost thoroughly and then reheat in a medium oven for 7-8 minutes, until hot. Old recipes need to be revisited. Viewed afresh. Updated. There are new ideas and techniques. Ways to improve. Ingredients which have become more readily available. Others which are outdated or have fallen out of favour. So this is my updated Caramelised Shallot & Chestnut Tarte Tatin. The perfect vegetarian and vegan centrepiece for Christmas dinner. I first wrote a version of this recipe back in 2009, having made it for Christmas dinner a few years earlier. My Uncle John was visiting from Ireland for Christmas, an event in itself, which always involves much silliness, standing on chairs singing nursery rhymes and a vegan alternative to turkey for us all to share. The original recipe (such as it was, made, eaten and enjoyed, but never written down) was vegan, but the pastry will no doubt have been made using White Flora, a white vegetable fat, which has long since vanished from shop shelves. Its closest dairy-free equivalent, Trex, is made from palm oil. Whilst it may make good pastry, I won't buy it. The same goes for the principal dairy-free ready made puff pastry on the market, Jus-Rol, or indeed anything containing palm oil. Its connection with rainforest deforestation, human rights violations, child labour and animal cruelty (to name but a few) is well documented. I'm with Joanna Blythman, journalist and author of Swallow This, when she says that going into 2017 it is time to abandon palm oil. So this tarte tatin has a classy new pastry to be proud of. Rich and packed with fresh thyme, it is simple to make and work with. There's no need to be careful and light of finger when mixing the ingredients, and definitely no rubbing fat into flour until it resembles breadcrumbs. When dry ingredients meet wet ingredients, the pastry comes together in a matter of seconds. A vegan-friendly pastry recipe which uses olive oil instead of palm oil. 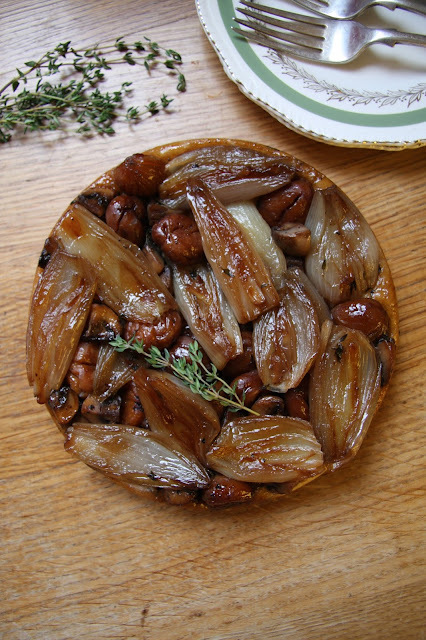 The combination of shallots, chestnuts and mushrooms is not a new one. Especially at this time of year, when they are all in season and at their best. Add a splash of madeira and plenty of fresh thyme and they taste so good. Begin by making the pastry (this can be done up to 24 hours ahead). Put the flour, baking powder, salt, fresh thyme leaves and nutritional yeast (if using) into a large mixing bowl and whisk together with a balloon whisk. Add the olive oil and 70ml cold water. Using your hands, bring the ingredients together to form a rough ball. Knead lightly for a few seconds until the pastry is smooth. Flatten the pastry out into a patty, wrap in cling film and chill in the fridge for at least 30 minutes (longer if possible). Whilst the pastry is chilling, prepare the rest of the ingredients. Peel the shallots and slice any large ones in half lengthways. Clean the mushrooms by wiping them with a piece of kitchen roll, then trim off the stalks and cut into quarters. Put a tarte tatin dish dish (20cm diameter) or an oven-safe frying pan of the same size over a medium heat. Add the olive oil, then place the shallots into the dish, cut side down (for those you have sliced in half). Cook for 10 minutes until the shallots are starting brown slightly. Add the chestnuts, mushrooms, thyme leaves and sugar, pushing the chestnuts and mushrooms down gently between the shallots. Cook for another 5 minutes, then add the madeira, season with salt and freshly ground black pepper and cook for 2 to 3 minutes. Remove the pastry from the cling film and place it on a lightly floured surface. Roll out, turning with each roll, until it is a rough circle measuring about 22cm in diameter. Using a pastry brush, brush a little oil around the inner rim of the tarte tat in dish, then careful lift the pastry over the shallot mixture, tucking it in, and any surplus pastry back on itself, to form a seal. Bake for 30 minutes, until the pastry is a light golden colour. Slide a knife around the edge of the pastry to loosen. Put a plate over the dish and then carefully tip the dish with the plate held firmly on top over so that the tarte tatin is sat shallot side up on the plate. Remove the dish. 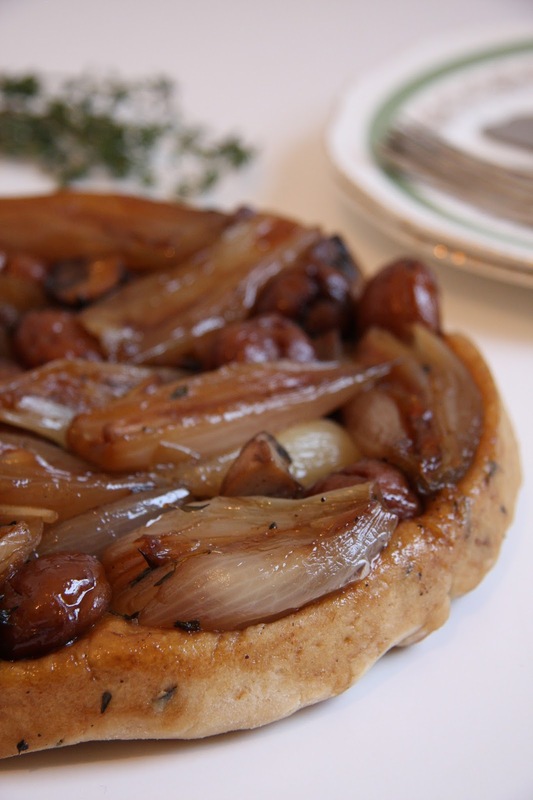 If any shallots decide to stick to the dish instead of the pastry, carefully lift them off the dish with a fish slice or spatula and put them back into position on the pastry. I like to serve this with roast potatoes, buttered kale or cabbage and vegan gravy. *not all brands of madeira are vegan-friendly, so if you are making this for someone who is vegan it is worth checking. You're on the home straight. The final push. You need to keep your energy (and spirits) up. 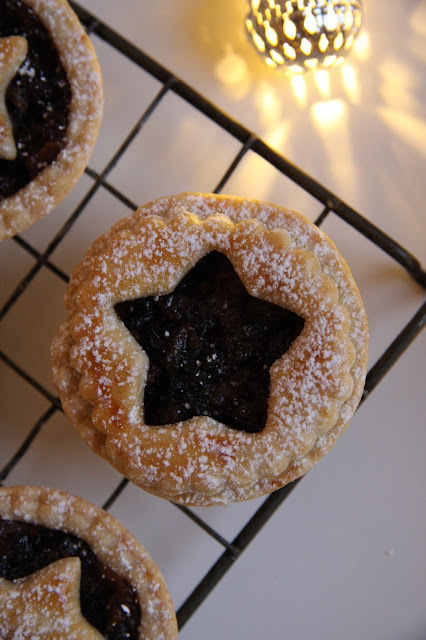 Whether you're partying hard, wrapping a mountain of presents, ferrying children from party to performance or staying up half the night, bleary-eyed, with gin in hand, trying to create a nativity costume (with the stars falling off as quickly as you can stick them on), you need sustenance. This is no time for self sacrifice. These little morsels of rocky road are easy to eat. Too easy perhaps. Blink and you've demolished four. So make them, give half away as festive gifts (another job ticked off that mother of all lists) and let yourself loose on the rest. And if you are worried about that calorie thing, then take the advice of Mum's work colleague: break a piece in half, shake out the calories and get eating. Grease and line a 20cm square, loose-bottomed baking tin. Break up the chocolate and put it into a large heat proof bowl with the butter. Place the bowl over a pan of simmering water (taking care to make sure that the bowl doesn't touch the water) and, stirring occasionally, leave the chocolate and butter to melt. Whilst the chocolate is melting, blot the maraschino cherries on kitchen paper to remove most of the syrup and cut each one in half. Put the amaretti biscuits into a plastic sandwich bag and bash them a little with a rolling pin until they are roughly broken up. Once the chocolate has melted, add the condensed milk, salt, amaretto liqueur (if using) and orange zest. Stir to combine. Add the maraschino cherries, toasted almonds and amaretti biscuits. Stir until evenly coated in the chocolate. Transfer the mixture to the prepared tin, spread out to fill the tin and smooth the top with the back of a spoon as best you can. Put the tin into the fridge for an hour, or until solid. Alternatively leave overnight. Then remove from the tin, discard the baking paper and carefully cut into small pieces. Dust with icing sugar. Store in the fridge or a cool place. One of my earliest memories of food at Christmas time is of my mum appearing by my bedside late one evening, a large mixing bowl rested in the crook of her arm. It was dark, with just a flicker of orange light creeping in through our old brown curtains from the street light outside. I felt snug under my crisp sheets and eiderdown, and comforted by the familiar sounds around me. Yet I was drowsy and bewildered. Looking back now, the wooden spoon being proffered can only have been for me to stir our Christmas pudding. In that hazy light, as if watching myself on sepia-tinted film, my faded memory sees me push myself up, resting on one elbow as I dutifully stir the heady mixture of dried fruit, cinnamon, nutmeg, orange and brandy. With my sleep-heavy limbs, I managed one, maybe two, turns of the bowl before I settled back down, contented. It has been a long time since I have been around to give my mum's Christmas pudding its traditional stir for good luck. Instead it is my turn to pass these traditions on to my sons. The huge, old Mason Cash mixing bowl, with its crazed glaze. A tarnished old tablespoon which was tucked into my kitchen box when I left home for university. And one of many well-used wooden spoons, which have stirred food, banged pots as if they were drums and will one day themselves be packed into a bag leaving home for the future that lies ahead. 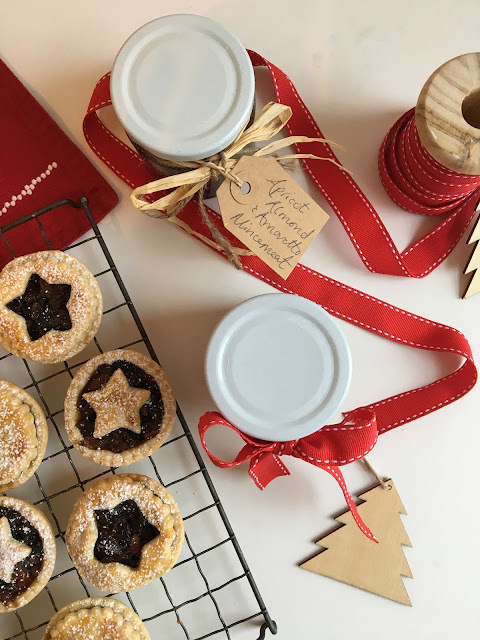 As I grew older, my memories of festive baking with my mum, in the kitchen of our little two up two down, turned to mince pies. Not just the odd dozen here or there. 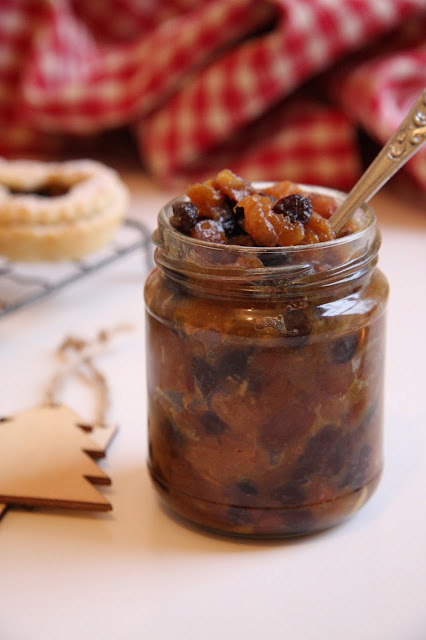 Tray after tray of brandy-laced mincemeat wrapped up in flaky shortcrust, always lovingly made by hand. 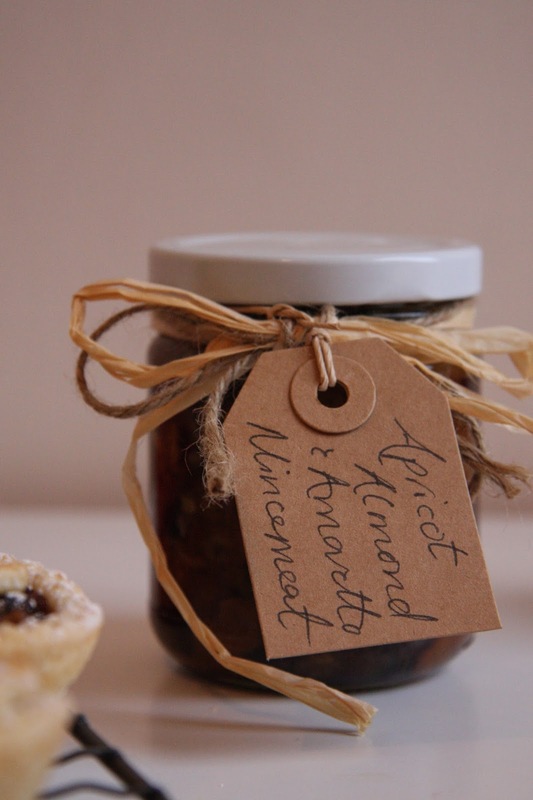 The mince pie tin has to be seen to be believed. One minute filled to the brim with two, maybe three dozen rich, buttery pies, only for hands grappling to be the first to reach the last one moments later. The very best mince pies are those crammed so full with boozy, homemade mincemeat, that it seeps out like molten lava as they bake. My mincemeat recipe evolves year on year. This is the third iteration of 2015. The jars to be polished off this week before we embark on a new batch for 2016. Mix the raisins, currants and sultanas in a large mixing bowl and pick over to remove any stems. Put a large pan over a low heat. Add the butter, sugar, orange and lemon zest and juice and stir until the sugar has dissolved. Add the grated apple, raisins, currants, sultanas, dried apricots, almonds and spices. Stir to combine. Put the mixture back into the large mixing bowl and stir in the amaretto and cognac. Cover with a tea towel and leave in a cool, dark place for at least 24 hours. *Please don't be put off by the list of random dried fruit. I like to use lots of different sultanas, raisins, etc for their size, flavour and colour, but you could just use the equivalent weight of whatever you have knocking around in the cupboard. Just make sure you use the dried apricots for this recipe because it really does make a difference.